“A nice walk. Peace. Quiet. Rest. Tranquillity.” I nodded in agreement with myself as three cars zoomed noisily past at 60mph. A huge lorry picked up speed in an attempt to beat the changing traffic lights, forcing me to scurry back from the crossing. “Carefree. No one to see, nothing to do but relax for a few hours.” I took a sideroad, began to move away from the traffic, just as a red car screeched round the corner. I stood for a moment, attempted to calm down. As I stood, the road noise abated before abruptly being replaced by the sound of the Crystal Maze theme tune rendered badly by a battered mobile phone. I released an inner sigh, put on my best “That’s great news!” voice and began to wish I’d left my mobile at home. It was August 2011 and I was unemployed and getting tired. Tired of looking for jobs. Tired of thinking about what to say for interviews. Tired of visiting the Job Centre to justify why they should give me some money. Tired of sitting in front of the computer all day waiting for that elusive offer of gainful employment to appear. Tired. So very tired. And that was just after three weeks of doing it. I was getting worried. Not about the job – I’d taken redundancy from my previous role and had enough money to live on for the time being – but more that I had run out of goals to achieve. I’d had some holidays, walked across Scotland and now I was just job hunting most of the time. And job hunting is tiring. Obviously, I needed something to do. I’d tried doing some day walks in order to get out of the house but just wandering around the south east of England wasn’t cutting it for me. I needed a goal. I needed to achieve something. But what? I couldn’t go away anywhere as I needed to be scouring job ads and sending my CV off left right and centre. No, I needed a goal that I could attack in bits and pieces; day long chunks that, when assembled together, would make a perfect whole. 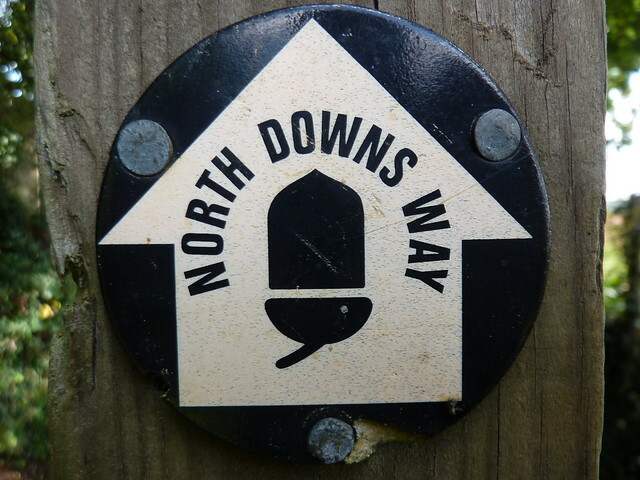 The North Downs Way was the obvious answer. Running across Surrey and Kent the North Downs Way follows, funnily enough, the North Downs over 153 miles of the South East’s countryside, from Farnham to Dover. Whilst it can, obviously, be done all in one go or in two or three chunks, the fact that it frequently crosses over train lines and visits towns and villages with a rail link means it’s especially easy for the London based walker to complete by doing a series of day long hikes. With a few exceptions, it’s easy just to leap on a train in a spare day, do a full days walking and then head back in time for tea. And that was why I was stood next to an elaborately carved signpost at a road junction with the A31 in Farnham that denoted the start of the whole thing, attempting to relax. And talking to Tim of course. Next time: we leave Tim behind and head on our way to the fun, the glamour, the excitement of… Guildford. 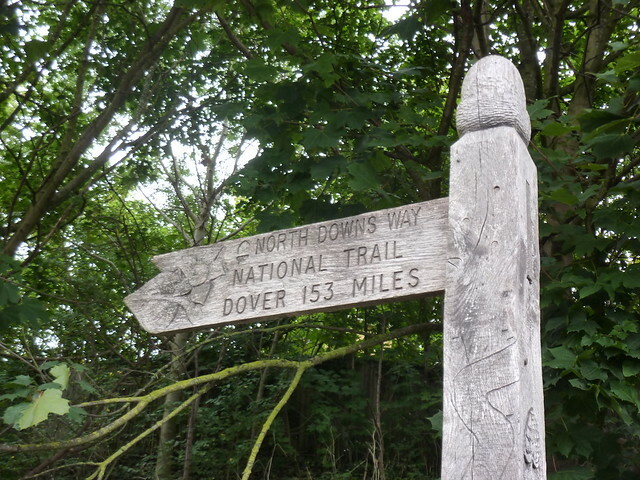 having done the Pennine Way in 2017 and the Coast to Coast this year I fancy a change of scenery and looking at the North Downs Way, It’s a long way form Inverness but… I have a friend in Dover, at least I still think she is a friend, but I have not seen her in 34 years. So my worry now is after reading this intro that the NDW is going to be ruined by been too close to fast moving traffic all along the way, I hope someone is going to tell me that’s not the case at all? Hello Tim – don’t worry. Although the trail starts in a rather noisy, busy place, it does get away from the road very quickly. It has to be said that you will hear traffic noise on some sections of the route, but you’re not particularly close to busy roads. First Published: 8 January 2013. Last Updated: 24 April 2014.